I love, love, love that lip stamp. These cards are great Kendra. I think I might have to do some of these smaller cards for V Day. I'm never done a 3x3. Very pretty! 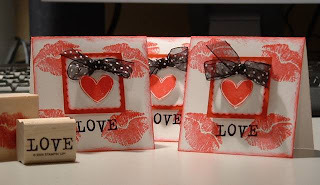 I had never thought about doing 3x3 cards for Valentine's day, that's a great idea!! Thanks for sharing!!! Those are so darn cute!!! The 3X3 is going to be the size I do for my kids this Valentine's Day!